the overall lack of truly meaningful progress in stem cell research in the last twenty years. The science tracks featured current research in different stem cell areas including the production of safe hESC (human embryonic stem cells) and iPS (induced pluripotent stem cells) for use in regenerative medicine, the research and therapeutic use of mesenchymal stem cells (MSCs) and hematopoietic stem cells (HSCs) and reports from specific sub-fields: cancer stem cells, cardiovascular stem cells and neural stem cells. Overall, the work presented was incremental and in many cases, confirming what has been known already, such as a growing confirmation that cancer stem cells are probably responsible for triggering the resurgence of cancer but cannot at present be distinguished from other cells at the time of tumor removal. One stem cell area experiencing growth is contract research organizations, the outsourcing tool of choice for research labs and pharmaceutical companies in the production of biological materials. For large contract research manufacturing such as Basel, Switzerland-based Lonza, the biggest demand area is in cell therapies. Cell therapies denote the introduction of any type of new cell into other tissue for therapeutic purposes, but in the current case generally means any variety of stem cell-based therapies. Other large contract research manufacturing organizations such as Morrisville, NC-based Diosynth (owned by Schering Plough) lead in biologics (antibodies, protein production) production, an important area for nextgen biotech where synthetic biology could have a big impact. For smaller contract research manufacturing organizations producing test compounds (e.g. ; 1 liter for $10,000) and scaling to Phase I and II clinical trial quantities such as Baltimore MD-based Paragon Bioservices, the biggest demand is for recombinant proteins. Recombinant proteins are created by inserting recombinant DNA into a plasmid of rapidly reproducing bacteria and can take many useful forms such as antibodies, antigens, hormones and enzymes. Zinc fingers (small protein domains that bind DNA, RNA, proteins and small molecules) have been surfacing in a variety of cutting-edge biotech innovations. In July 2009, St. Louis, MO-based biotechnology chemical producer Sigma-Aldrich (SIAL) announced the creation of the first genetically modified mammals using zinc finger nuclease (ZFN) technology to execute modifications such as taking away the tail of the zebrafish. A second example of recent landmark research involving zinc fingers is that of Carlos Barbas at Scripps who uses zinc finger proteins to reprogram serine recombinases as a more specific alternative to the homologous recombination method of genome modification. In addition, the Barbas lab has a useful web-based zinc finger protein design tool available for public use, Zinc Finger Tools. Real-time PCR offerings continue to expand and flourish with declining prices as startup newcomer Helixis announced a $10,000 real-time PCR solution at the conference. Bethesda, MD-based Toucan Capital, a leading investor in stem cells and regenerative medicine discussed their sixteen interesting portfolio companies such as San Diego CA-based VetStem who is conducting joint and tendon stem cell therapies for race horses. Johns Hopkins has one of the country’s leading technology transfer programs, licensing a growing number of technologies each year (nearly 100 in the last fiscal year), and has a searchable, though not extremely user-friendly, website. One of the world’s fastest accelerating technologies is that of genomic sequencing. The first whole human genome (6 billion base pairs) was sequenced at a cost of $3b and was completed in 2003. The current cost is $20,000 for researchers (Complete Genomics) and $48,000 for consumers (with Illumina’s EveryGenome program). Leading third-generation sequencing company Pacific Biosciences affirmed at the Cold Spring Harbor Laboratory Personal Genomes meeting September 14-17, 2009 that the company has 12 prototype instruments in operation and continues to be on track for ~$100 (“the cost of a nice dinner”) whole human genome sequencing to be commercially available in the second half of 2010. NimbleGen indicated that they may have a $2,000 exome sequencer available in 2010. In a challenging venture capital climate, Pacific Biosciences was able to close an additional $68m round in financing on August 12, 2009. Leading commercial sequencer Complete Genomics was also notable in closing a $45m D round on August 24, 2009. The company has sequenced 14 whole human genomes to date, and hopes to sequence exponentially more, 10,000, in 2010 at a minimum cost of $5,000 per genome. Where the genomics technology sector has rosy prognostications, the direct-to-consumer personalized genomics market has volatility. Events in the last several months have led to questions of the sector’s viability with upheavals at the three leading companies, 23andme (“Avey Leaves 23andMe to Start Alzheimer's Research Foundation Using DTC Genomics Firm's Platform"), deCODEme (“deCODE close to broke” – Augusty 11, 2009) and Navigenics (“Navigenics Names Jonathan Lord, MD to Serve as President and Chief Executive Officer” April 7, 2009). Absent innovation, DTC genomics companies are a “window business” in the sense that the window for their current offerings may only be open for a short time with the advent of whole human genome sequencing and standardized public multi-SNP condition interpretation tools. 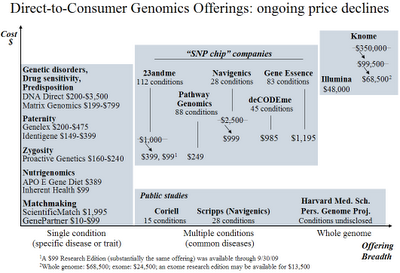 As depicted in Figure 1, there are three types of Direct-to-Consumer (DTC) genomics offerings currently available directly to individuals: one-off SNP (single nucleotide polymorphism) tests for specific conditions and paternity tests, multi-SNP risk assessment tests mapping several SNPs to dozens of disease conditions and whole human genome sequencing assessing hundreds of disease risks. The five companies offering multi-SNP risk assessments are: 23andme ($399 for 111 conditions), deCODEme (42 conditions for $985), Navigenics (28 conditions for $999), Gene Essence (84 conditions for $1,195) and Pathway Genomics (77 conditions for $249). 23andme, deCODEme and Navigenics are the most transparent, disclosing the specific SNPs, research references and risk assessment methodologies for their tests, Gene Essence discloses SNPs and Pathway Genomics does not disclose anything. A detailed condition and SNP analysis is here. DTC genomics has had slow adoption so far for several reasons, first, there has been very little marketing, few consumers know of the availability and value proposition of DTC genomics services. Second, since automated tools are not yet available, many people are not interested in preventively managing their health, and may still perceive it to be in the responsibility and domain of health care professionals. Third, the conventional but incorrect view is that genetic information is already known (from family history), negative and deterministic. Fourth, as initially pointed out by ExperimentalMan David Ewing Duncan, there are conflicting interpretations from DTC services for the same conditions such as heart attack. This is because the scientific community has little knowledge and agreement yet regarding multi-SNP conditions. DTC companies are looking at different SNPs, assigning different quantitative risk values and employing differing estimates of overall population averages which all contribute to heterogeneous interpretations of risk for the same condition. Several promising startup companies focused on the nascent but obviously significant and growing anti-aging biotechnology space were present or discussed with interest at the recent SENS4 (Strategies for Engineered Negligible Senescence) conference in Cambridge, U.K., September 3rd – 7th, 2009 (program) (full conference report). If all chronic disease and aging becomes controllable and there is effective immortality, does uploading matter as much? If artificial general intelligence is achieved, how does that change the exigency and requirements of molecular nanotechnology? If affordable space launch and space-based solar power is achieved, what happens to ethanol, electrical and other terrestrial alternative vehicle and transportation infrastructure solutions? If immersive virtual reality and post-material scarcity are achieved, does molecular nanotechnology matter and what happens to global political systems? If whole human genome testing is available, do single SNP tests go away? If there are home health monitors and nanodiagnostics, do primary care physicians go away?